Why Buy Donated Vehicles From Us? Many people who donate vehicles originally buy nice cars and keep them up well until some significant problem develops. Maybe the car won’t pass smog, the transmission starts slipping or the ac quits working and the owner prefers to buy a new car rather than repair the one they have. Often these people are not offered a trade in value they like, they don’t want the challenges of selling their used car themselves and a tax deduction is appealing, so they decide to donate their vehicle. That is where our expertise comes in. We work with local repair shops, salvage yards and mobile mechanics to get these vehicles repaired at a fraction of what it would cost the average person. We have all kinds of repairs done, body work and paint, motor and transmission rebuilds or replacement, smog, windshield and AC repairs, all of it. By repairing a vehicle that might only be worth a few hundred dollars as is, we turn it into something of value to a person needing transportation as well as an asset for our organization. 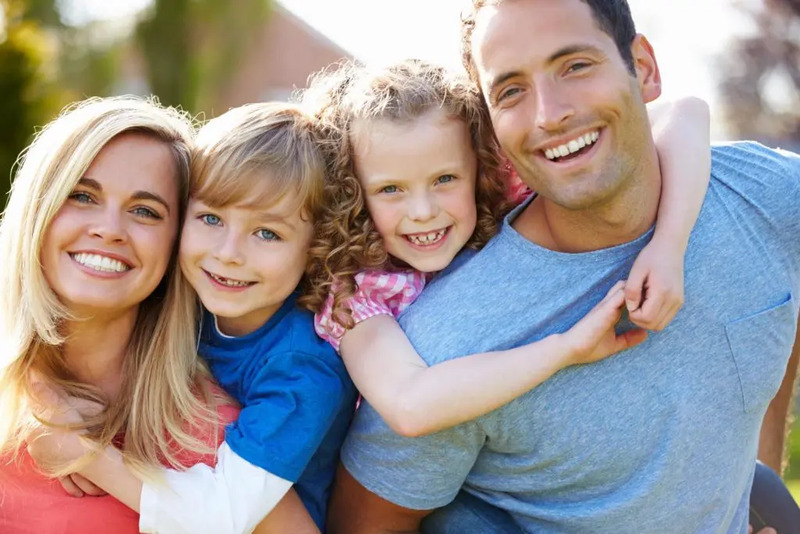 The donor receives a tax deduction based on the sale price of the repaired vehicle, our organization receives attractive revenue and the buyer gets a car that has often been well maintained, so it really is a win/win for all parties. Cars that we put up for sale are subject to a 19 point checklist and most are sold with smog certificates. We seek to make the vehicles we sell into the kind of cars we would drive ourselves, and we do test drive them before we put them up for sale. While we do not seek to repair every defect on every vehicle we do strive to be brutally honest about what we know about the vehicles we sell and the repairs we have made. Over the past 11 years of our operation and 4000 vehicles sold, we have always believed that both we and the car buying public are best served by this policy of disclosing what we know about vehicles to potential buyers. Largely because of this policy and our desire to sell cars we would drive ourselves, we have customers who come back to us year after to year to buy more cars or simply tell us that they are still driving the car we sold them and it is doing great. Of course many of the vehicles we sell need repairs that we chose not to preform and we call these ‘mechanic specials’. Many of our buyers are mechanical and buy cars for parts, to repair and drive, use as father/son projects, or to repair and resell. We write directly on the windshields the issues we discover with these cars so mechanical buyers know what they are getting. Many of these buyers get one car after another from us because they know what they are buying up front, not like auctions where they just have to guess what might be wrong just by looking at a car from a distance as the auctioneer passes by it. We also have a no pressure sales policy, we simply don’t need or want that, our cars sell themselves. People are free to come and go or look around the lot at their leisure without talking to anyone if they like, but of course there is someone there to help if they wish. Car pricing is based on our experience over many years of selling cars in Las Vegas. Some cars will be way under ‘book’, some over, it just depends on the year, make, model, mileage and our experience of the desirability of the vehicle in question. We have everything from classics, economy cars, trucks, motorcycles, to motorhomes, golf carts and boats. We seek to balance our goals of raising money for paralyzed veterans and providing the public with vehicles at affordable prices. Most running/driving smogged vehicles we sell range from $2000-$3000 but the nicest vehicles will be significantly higher than that range. Mechanic specials are usually around $300. IRS regulations prevent us from taking trade-ins or offering financing, those are considered ‘for profit’ activities that only car dealers can offer. We accept cash or wire transfer only. Because the average smogged vehicle on our lot is about 15 years old and priced around $2,500, we cannot offer any type of warranty, all cars are sold ‘as is’ with no guarantees but you are free to start them, bring your mechanic to check them out, mull it over before you buy. We will not accept deposits on vehicles, all sales are ‘first come, first served’. We are a local organization with a car lot at 4000 Boulder Highway and administrative office on Jones Blvd, so the funds we raise for disabled veterans, the repair shop we use, mechanic costs and sales expenses we incur, all support local residents, not some giant operation in another State. Here in Nevada we have our own vehicle donation program, we are not associated with any large national donation operation. Keep in mind that because we repair about 3/4 of the vehicles donated to us, our costs are significant, but even after the advertising, rent, labor, parts, utilities and all the rest, we still raise substantial revenue to benefit veterans in wheel chairs who have served our country, so buying a vehicle from us gives back to them. After all these vehicle program related bills are paid approximately 87% of the funds we raise annually go to programs directly supporting disabled veterans. 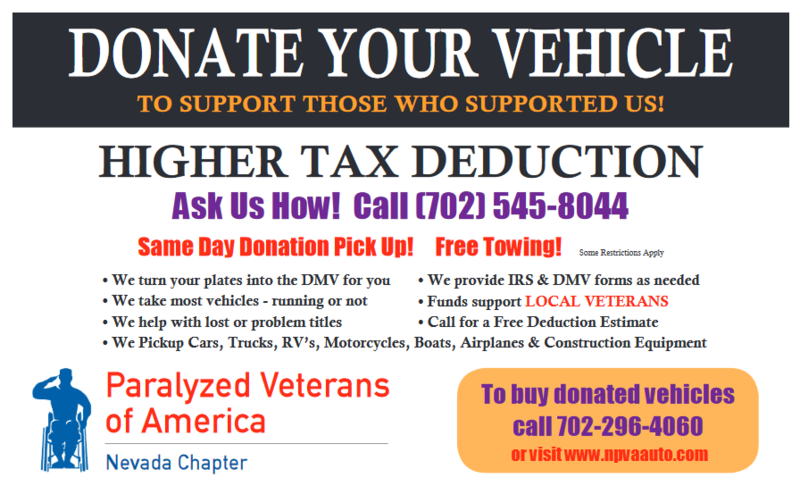 To find out more about how we serve local veterans visit our “Why Donate Vehicles to Us” webpage. So to support local veterans, workers and businesses, and won’t you visit our inventory page or sales lot and see what we have? We would be grateful if you did.